Click here to see the entire magazine! Hairstyles may come and go, but it seems mermaid-length tresses are still all the rage. Listen, even the Kardashians can only go so long without their clip-ins. But heavy (and often pricy) extensions don’t have to be the only answer to hair past your shoulders. We won’t lie, growing out your hair is not an easy feat, it takes time and a ton of patience. According to our experts, your strands grow an average of 1/2 inch on a monthly basis. Make the most of the time in between with these healthy hair tips. “[Ingredients like] Biotin, saw palmetto and horsetail extract may help to inhibit DHT, which promotes healthy, strong hair and increased growth activity from the follicle level,” advises Shelton. The Holiday Hair Color Forecast: Which Shades Will We See? 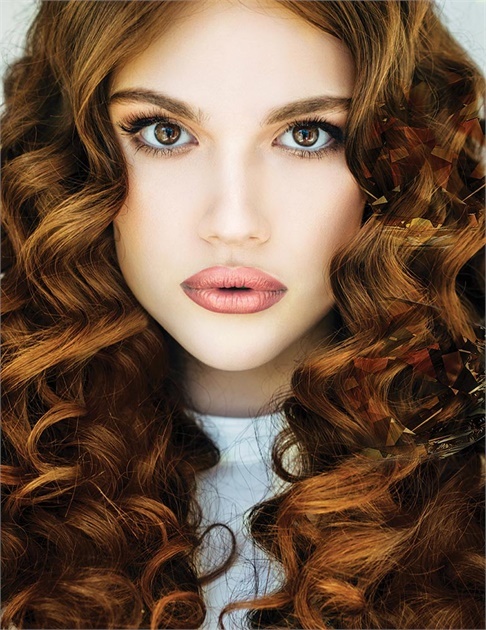 Depth will define hair color this fall, as the ashy, cool shades of summer transition to rich mahoganies and wine shades along with softer blondes, predicts JB Shelton, an educator for Bosley and owner of new Detour Salon and Style in suburban Indianapolis. “Clients will want natural looks that have an urban edge,” Shelton forecasts. Goldwell Artistic Director Rebecca Hiele frames the trend around luxury. Chances are you’re guilty of one of these bad habits. You buy color-safe shampoo to keep your highlights rich; you use heat protectant before powering up a straightener; and you’ve even stopped washing your hair daily to avoid drying and breakage. You've done everything to ensure the health and appearance of your strands. Right? Unfortunately, there are a number of hidden troublemakers and daily habits that could still harm your hair. The damage might not be obvious at first, but these eight saboteurs are secretly destroying your locks. 1. You style your hair when it's dripping wet. Although your first instinct post-shampoo might be to run a brush through your wet strands, you’d be wise not to. “When hair is wet, it loses elasticity—its ability to stretch and bounce back into place,” explains Bosley Professional Strength Specialist, J.B. Shelton. She recommends using a Wet brush and a detangling spray for smooth, break-free brushing. Because hair is most vulnerable when wet, Theresa Adams, Master Stylist at Dop Dop Salon in NYC also advises against pulling hair back too tightly when wet. “Clients have come in with ponytail line of breakage in their hair,” she warns. 2. You wash your hair in hot, hot water. Believe it or not, the temperature in which you wash your hair matters. “Shampooing and conditioning your hair in super hot water can leave your hair cuticle open and exposed to the elements,” says Sarah Potempa, celebrity hairstylist and inventor of the Beachwaver. Do a final rinse with cool water to close the cuticle and protect hair from damage and breakage. 3. You're still using 2-in-1 products. 4. You're using the wrong hot tools. If you’ve ever wondered whether the expensive blow-dryer or flatiron was actually worth the price tag, it turns out it just might be. According to Adams, quality hair tools maintain heat better, so you end up using the tool for less time and receive an equal distribution of heat throughout each strand. This means no more going over the same section over and over and practically watching your hair fry. The less time heat is touching your hair, the better. 5. You threw away the nozzle to your blow-dryer. Although many of us simply ignore the attachments that come with a dryer, remember: They’re there for a reason. “Blow-drying your hair without the nozzle will leave your hair frizzy and open to damage,” says Potempa. Position the nozzle parallel to each section to help close the cuticle. If you have curly hair, reach for the diffuser attachment to cut down on styling time and maintain the hair’s natural coil. And as always, use a heat protector like TRESemmé Thermal Creations Heat Tamer Spray, which defends hair against heat and friction. 6. You're not thinking about SPF protection. Just as SPF is crucial for proper skincare, sunblock is essential for strong, healthy hair. Sun protection reduces the risk of fading color and keeps hair from drying out, says PHYTO National Educator, Christyn Nawrot. For daily use, select an invisible sunscreen spray that provides weightless and greaseless protection. She recommends Phyto Plage Protective Sun Veil. 7. You've never cleaned out your blow-dryer vent. We know what you’re thinking, “I didn’t even know that was a thing.” A dirty vent is actually a disaster waiting to happen. “When the vent is clogged with dust and hair, the air circulation is depleted,” explains Shelton. Not only will this fail to effectively blow-dry your hair, in some cases, the clogged tool may actually damage hair strands and cause breakage. In worst cases the dryer could snap, pop, and burn the hair (yikes)! 8. You're using the wrong brush for your hair type. Finding the correct brush for your hair type is key, says Nawrot. When hair is wet, reach for a wet brush or wide-tooth carbon comb, which reduces static electricity and holds up to repeated use. For fine hair, Nawrot suggests using a 100 percent boar hair brush, which gently stimulates the scalp, assists with healthy blood circulation, and aids in the distribution of the scalp's natural sebum. “Boar bristles are porous, just like our own hair,” says Nawrot. “The brushing action helps move the oil down the hair shaft while closing the cuticle for a brilliant, lasting shine.” Sebaceous oil is hair's natural protection and is the best thing to prevent breakage, especially if hair is shoulder length or longer. Lastly for coarse, thick hair, Nawrot suggests using a combination boar and nylon tool or a synthetic fiber brush to allow for detangling and styling. Looking to makeover your crown, but not sure where to start? Start with the simple things! Bosley Professional Strength Educator, J.B Shelton, talked to us about the easy things anyone can do to improve their hair instantly. If you're noticing your hair is thinning or breaking, begin with a few small fixes to whip your tresses back into shape. Problem. Waking up to breakage. If you have long/medium hair, tossing and turning on cotton pillowcases in your sleep can cause friction, resulting in dryness and thus hair breaking off. Solution. Place your hair in a loose bun on the top of your head (think top knot!) or change your cotton pillowcases to satin. Problem. Addicted to ponytails? We can't blame you, but the style can get you into trouble after a while. Wearing tight ponytails and elastics with metal clasps can cause your hair to break from high tension. Solution. Sometimes you can't avoid wearing a ponytail for work, school or simple convenience, but there are ways to improve how you rock them. Use cloth elastics and wear your hair down for every day that you wear it up. Problem. You're in a rush and need to quickly curl your hair right after you shower, but using any heat tool when your hair is damp can cause your hair to boil. Solution. Did you know that professional heating tools can reach upwards of 400 degrees? It is extremely important to dry your hair 100%! This is a no-brainer. Problem. Everyone likes a steamy hot shower, but this can be bad for your hair. Excessive hot water can cause your cuticles to swell, which can trigger the Ph to become unbalanced, and this exacerbates color fading. Solution. Look for a shampoo and conditioner that helps with color retention. Also avoid using excess heat which can also dry your hair out. When you rinse your conditioner, rinse it out in cool or luke-warm water. This will help seal the cuticle! If you are experiencing hair loss, try using Bosley Pro Nourishing Shampoos and Conditioners ($18). Dealing with female hair loss? Check out what tips you can get from your stylist on how best to style thinning hair and how to keep your self esteem high while dealing with hair loss. We’ve all had them: hair problems. Because of those split ends, a color job gone bad or — eeeek! — a nightmarish DIY bang trim (been there, and nothing’s worse), our hair can feel like a blessing and a curse. That’s where this series comes into play. In every installation of Hair Problems, we ask our network of hair experts about the most annoying issues real girls are dealing with, and they sound off with the solutions. The Problem: As the weather warms up, it’s natural to want to throw your hair up too. Leaving it down, grazing your shoulders and back when the sun is shining and — let’s be real — you’re sweating, just isn’t a good feeling. That’s when the super versatile hairstyle that is the *ponytail* comes into play. Instead of resorting to your go-to pony routine, consider using these seven expert tips that’ll take your pony from plain to poppin’ in no time. Have a hair problem you want us to solve? Email beauty@brit.co with what you’d like our experts to weigh in on — and don’t forget to follow us on Pinterest for all the hair inspo you’ll ever need. Beth is the beauty editor at Brit + Co. You can typically find this Texan writing, trying on a new lipstick, gabbing with her identical twin sister or volunteering at the local animal shelter. She finds inspiration from rosé, beauty products, Tex-Mex and cats. Hair loss and thinning may be a topic that no woman wants to talk about, however, it’s one that affects 30 million women in the United States, according to the American Academy of Dermatology, and can cause emotional and physical distress. If you’ve been noticing more hairs on your pillow or hairbrush than normal, you may worry that you have hair loss. You could actually just be shedding more hairs than normal. Yes, there is a difference! We normally to shed between 50 and 100 hairs a day. When the body sheds significantly more hairs every day, a person has excessive hair shedding and this is called Telogen Effluvium. Hair loss differs from hair shedding Hair loss occurs when something stops the hair from growing and this is called Anagen Effluvium. The benefits of Bosley Professional Strength Healthy Hair Vitality Supplements are far reaching. Not only do they provide your daily vitamin needs, they also help with hair growth at the follicle level. Supplements add strength to the production of the hair strand, before it even pushes through the scalp! One ingredient, Biotin, is great for hair, skin and nail health. Bosley Professional offers a wide-range of products to keep hair its healthiest. Now is the time to take preventative and proactive measures against the issue. With help from Bosley Professional Strength’s products and Master Stylist J.B. Shelton, The Makeup Examiner has some tips to help you with this increasingly common problem. Diet is an extremely important factor in hair growth! Protein and Vitamin D are critical for the body to produce and grow hair. Wearing your hair in ponytails too often is a no-no! Ponytails cause tension, tension causes breakage, and breakage causes hair loss. Try to limit your ponytail styles to a couple times a week and use a soft cloth, clasp-free hair band. If you must wear it up often for exercise, do a loose topknot for less tension. Not cleaning the vent in your blow dryer is a rarely discussed subject with your professional stylist, but very important for your dryer’s productivity. When the vent is clogged with dust and hair the air circulation is depleted. Your dryer will still blow air, but not effectively dry your hair. And in some cases, may damage and cause breakage! Or worse, snap and pop and burn the hair. Trimming the hair has nothing to do with the hair itself growing. BUT, it does have EVERYTHING to do with the ends of the hair not splitting and breaking off. When the ends of the hair are properly maintained, the growth of hair is maintained. visits, follow these 11 top tips to help your hair colour last longer. colour for longer and have revealed their answers. recommends waiting 24 hours before shampooing. suggests rinsing it with cool water and massaging the roots. colour,” Ryan wrote in an email to TODAY. also it can be detrimental to the colour. help prolong the brilliance of the colour”. shampoos in favour of products that are sulphate and alcohol-free. “Many over-the-counter products contain salts, sulphates and detergents. be because of clarifying on anti-dandruff shampoo. clarifying shampoos because they can strip the hair. strip your colour over time”. twice a week to add moisture back into your locks. treatments can help with avoiding this. for colour longevity,” he says. water solution together and apply before entering the water. Some girls are just #bornthisway when it comes to thick hair, but having voluptuous strands can be overwhelming at times. If you feel like toning down your mane check out these easy hair hacks for a more manageable 'do. 1. Ask your hairstylist to "take the weight out" of your hair. Hair dressers can trim your hair to take out a lot of weight. According to celeb hair stylist Sarah Potempa "adding long layers gives thick hair movement, while blending these layers with texturizing shears helps to lighten the hair." 2. Use serum. Serums and hair oils will reduce frizziness, making your strands lay flatter. This will make your lock silkier and much easier to tame. 3. Ask your hairstylist for an undercut. Kylie Jenner has rocked this edgy look, but it turns out it's good for lightening hair, too! J.B. Shelton, a Bosley Professional Strength Specialist says, "The undercut is a great way to remove a great deal of hair so the hair will lay smoother and sleeker. You can use this style by removing hair at the nape [of the neck] just under the occipital bone." 4. Use your flat iron. Texture gives hair extra volume. After drying strands, use your flat iron to get a sleek look. 5. Use a rubber hair tie. Those pretty knotted hair ties might look great on your wrist, but they won't hold up your thick hair. try a thick rubber hair tie. They hold their shape and grip your hair firmly to keep your thick hair in place. 6. Try a half-up 'do. Thick hair is perfect for a half-up hairstyle. Your bun will look full and volumized, while also taking some of the thickness out of your bottom layer. 7. Grow your hair out. Longer hair is heavier, which helps it to lay flat and reduce volume. 8. Comb your hair with a paddle brush while you're in the shower. Potempa says you should brush out your hair after you've conditioned to eliminate knots, then again with a wide tooth comb once you get out of the shower to delete tangles for good. 9. Rock a center part. A side part makes hair appear thicker, at least on one side. A center part evenly distributes your hair, which will help to take some of the volume out. 10. Use a clarifying shampoo. Potempa says this will keep your thick mane from being weighed down with excess product and grease. 11. Never leave the house with wet hair. Wind and humidity can all make your hair a wild mess, especially if it's already damp. Potempa says you should "wait for your hair to dry all the way before leaving the house." This will prevent frizz because dry hair holds its sleek shape much better than damp hair. Follow @Seventeen on Instagram for all the best hair hacks. Whether you’re battling a particularly blustery day, the wrath of too much hairspray, or an inadvertently restless night of sleep, tangles happen. Unwanted knots, loops, and frizz are just a way of life for anyone with any length at all to their hair. But sometimes battling tangles can be a serious business: Brush them out while dry and run the risk of creating more tangles; brush them out while wet and possibly cause breakage. It’s a lose, lose situation when it comes to knots. To show you how to fix tangled hair, we chatted with two top hairstylists to get the scoop. Tangles, in general, occur when hair is lacking hydration. “Moisturize hair if you are tangle prone—always!” says TRESemmé Celebrity Stylist, Jeanie Syfu. “Choose a shampoo and conditioner that works best on your hair type, but never skip on conditioning ends!” In addition, many tangles are caused by wearing constant ponytails, sleeping with your hair down, and too much friction and tension on the hair, says Bosley Professional Strength Specialist JB Shelton. Lastly, another big cause of tangles: Dry ends that haven’t been trimmed in a while. Looks like that missed trim appointment is more important than you thought! If your tangles are the result of a little bit of a heavy hairspray hand, adding moisture to the hair might just be your best bet. “If my hair has too much grit from hairspray or other products, I take a few drops of a light hair oil, massage it into my hair mid-shaft to ends, then gently brush through hair,” says Shelton. “The oil helps break the product down and softens the hair.” Syfu also suggests using water or a serum to moisten hair. She also says to choose products that give more flexibility to your styling and have more natural hold instead of those that leave hair crunchy or have a high alcohol content. Syfu recommends applying conditioner to tangled areas while hair is still damp and using a wide toothed comb to work through knotted wet hair. “I’d also try applying a silicone serum on wet ends to create more slip and then comb or brush hair after you towel dry, blotting and squeezing water out so hair stays smooth,” she says. “Rubbing hair to dry it can create tangles.” However if your hair is really prone to tangles, she suggests brushing your hair while you’re still in the shower with a wide toothed comb. But if your knots are that bad, Shelton recommends using your fingers to pull apart as much of the knots as possible to avoid damage. The best way to ensure you don’t have to brush out your tangles is to stop them before they even start. Brushing hair more frequently, especially before bed, is a great way to avoid tangles, says Syfu. Also sleeping in braids is a fantastic option to keep hair smooth and knot-free, according to Shelton. “Going natural and air drying hair is a good way to prevent getting damaged ends as well as doing a cool rinse before getting out of the shower to seal the cuticle—it works wonders,” Syfu adds. Lastly, she suggests skipping heat tools daily and simply re-styling second-day hair into a bun or braid. “And invest in a good quality blow dryer and brush; this makes all the difference!” she says. Bosley Professional Strength and Educator, JB Shelton, were featured in “Heat Is The Enemy: 11 Tips To Help Your Hair Color Last Longer” on October 13, 2016. It was time for a color change, so you went to the salon and shelled out a small fortune on everything from highlights to lowlights and maybe even a glaze. Whether you wanted a simple, sun-kissed look or a dramatic change, the question now is: How will you make that color last until next time? TODAY turned to expert colorists to get their best advice on how preserve your color once you've left the salon. 1. Don’t head straight to shower. Celebrity colorist Ryan Pearl, who works at Cutler Salon in New York City, recommends waiting at least 24 hours before shampooing as this allows the dye to settle into the hair. If you’re desperate to get that clean-hair feeling, Pearl suggests simply rinsing your hair with cool water and scrubbing the scalp with fingertips. “A nice scrub will still cleanse the hair and scalp without pulling color,” Pearl said in an email to TODAY. 2. Skip the super hot water. That hot shower might feel good after a long day, but is it worth ruining your hair color over? We didn’t think so. 3. Think about switching up your favorite products. To keep your newly dyed locks, you just might have to say sayonara to some of your go-to products. “Many over-the-counter products contain salts, sulfates and detergents. That’s why they are so inexpensive. These ingredient strip hair color out!” said JB Shelton, an educator for Bosley Professional Strength haircare. Instead, look for products that are sulfate- and alcohol-free. They work just as well and will help your hair hold onto its color. 4. Space out your shampoo days. Even better, invest in a shampoo and conditioner treatment that’s designed specifically for color-treated hair, according to celebrity hairstylist Richard Collins, who has worked with stars like Helen Miren, Patricia Arquette and Vanessa Hudgens. Shin An, hairstylist and owner of Shin Hair Salon in Santa Monica, California, recommends the following two shampoos to preserve color. You can also try alternating between a hydrating shampoo and color-preserving shampoo, suggests Christyn Nawrot, an educator for PHYTO. But regardless of which brand you use, Nawrot says to look for shampoos with natural ingredients. 5. Say no to clarifying shampoos. Ever wondered why your friend's hair (or maybe even your own) suddenly turned orange? If it's color treated, a clarifying shampoo might be to blame. That's why celebrity hair colorist and salon owner Rita Hazan advises skipping clarifying shampoos as they strip the hair. She also warns that dandruff shampoos can do the same if they are not specifically designed for color-treated hair. 6. Use your hair wash in the right places. “Make sure to focus your shampoo on cleansing your root and not on the middle to ends of the hair as this will strip your color over time,” celebrity hairstylist Sarah Potempa wrote in an email. 7. The color of your conditioner matters. Conditioner is equally as important as shampoo in the hair-washing process. And many of the same rules apply for color-treated hair. Similarly, it matters not just what you apply, but how you apply it. “When using color conditioners, make sure to wring the hair out well and apply the conditioners evenly in small sections in order to thoroughly saturate the hair. Let it sit per the manufacturer’s instructions before rinsing,” said hairstylist Christopher Pierce of Andy LeCompte Salon in West Hollywood, whose clients include Sarah Michelle Gellar. Colorist and salon owner Chelsey Pickthorn recommends Davines Alchemic Conditioners, which comes in six different shades so that you can pick the color most similar to the lightest tones in your hair. 8. Invest in a conditioning treatment. Hazan is a fan of using a conditioning treatment once or twice a week, as it adds moisture back into the hair. Stylists continuously say that one of the biggest culprits of faded color is when hair becomes dry. An at-home conditioning treatment can help you keep hair healthy without heading to the salon. 9. Heat is the enemy. Yes, it’s true that you're damaging your hair every time you turn on your blow dryer or use that curling iron. We’re sorry to be the bearer of bad news. But, then again, it’s often the price to pay for a great style. If hot tools are a must, Pearl suggests using a lightweight oil or heat protectant prior to styling. “Adding your favorite hair oil throughout the mid-length and end of hair and combing through gives the hair a protective barrier and hydrates hair for color longevity,” Pearl said. Shelton also suggests turning down the heat on your hot tools. 10. Just like skin, the sun can be harmful for hair. 11. Think twice about taking a dip in the pool. “Plunging your hair into a body of chlorine isn’t exactly the best idea. Don’t swim in pools with chlorine as it will fade your color, but if you do swim, using a leave-in conditioner can reduce fading,” Collins advised. Pearl tells his clients to mix conditioner and water together in a spray bottle and to spray the mixture before and after dipping in the pool or ocean water.